Photo by The People’s Media Group, LLC. 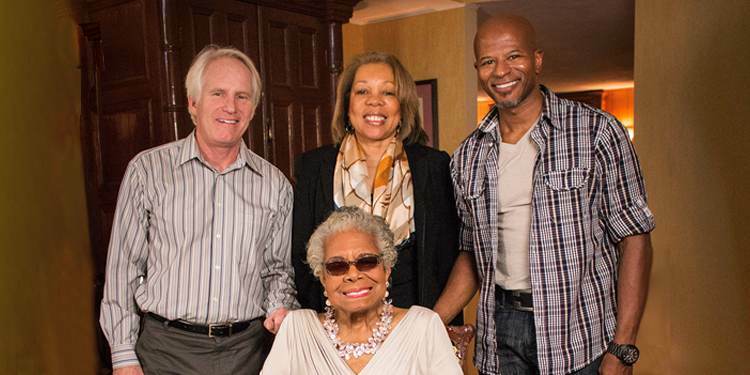 Dr. Maya Angelou, seated, with filmmakers Bob Hercules, left, Rita Coburn Whack and Keith Walker at Angelou’s home house in Winston-Salem, N.C., January 2014. Maya Angelou: And Still I Rise, the first feature documentary on the life of writer Maya Angelou, debuts on PBS’s American Masters at 8 p.m. on Tuesday, February 21 (check local listings). The two-hour film by Bob Hercules and Rita Coburn Whack traces Angelou’s life from her childhood in Depression-era Arkansas, through her career as a singer and dancer and her work with Malcolm X in Ghana, to her inaugural poem for President Bill Clinton. The documentary includes interviews with Angelou taped before she died in 2014, as well as with Bill and Hillary Clinton, Alfre Woodard, Cicely Tyson, Quincy Jones and many others. “The film reflects on how the events of history, culture and the arts shaped Dr. Angelou’s life, and how she, in turn, helped shape our own worldview through her autobiographical literature and activism,” Whack said. Maya Angelou: And Still I Rise is a co-production of The People’s Poet Media Group, Thirteen’s American Masters for WNET, and ITVS in association with Artemis Rising and support from the Corporation for Public Broadcasting. “Maya Angelou was a visionary who touched the lives of many Americans. CPB is proud to support this documentary and the film's #InspiringWoman initiative giving public media stations another avenue to engage audiences from all walks of life,” said Joseph Tovares, CPB chief content officer. With CPB support, American Masters is launching the yearlong campaign titled #InspiringWomanPBS, based on the themes central to Angelou’s life: artistic expression, academic success, active community engagement and acceptance of difference. Oakland, Calif. KQED will host a screening and performance event featuring Young Gifted and Black, Youth Speaks, and local poets and artists February 8 at the Grand Lake Theater. San Antonio. KLRN will host a screening and Maya Angelou-inspired poetry slam on February 15 at Playhouse San Antonio. Winston-Salem, N.C. UNC-TV will show a preview screening at Wake Forest University’s School of Business on Saturday, February 18, followed by a panel discussion featuring several longtime friends of Angelou. Atlanta. Georgia Public Broadcasting will host a spoken word workshop and teen poetry slam on February 18 and a screening on Monday, February 20, at the Woodruff Arts Center, which will include a dramatic reading by playwright and novelist Pearl Cleage and a solo dance performance by Moving in the Spirit. Audiences can also share stories of inspirational women in their own lives at pbs.org/americanmasters or via Tumblr, Twitter and Instagram using the hashtag #InspiringWomanPBS. A video compilation will be featured on PBS’s Instagram Stories and Snapchat channels, and additional footage from the documentary will be released during the campaign. (Congressman Ben Ray Luján, center, received the CPB Strengthening Civil Society Thought Leader Award in a program that highlighted how public media has raised awareness of the opioid crisis. Public media attendees connected with leaders from business and education in Salt Lake City. Wide-ranging portraits of the African American experience and culture include a four-part radio documentary.